Why do French Bulldogs Cost So Much??????????? Welcome to our home on the Web. You have been warned, you will catch Frenchie Fever. 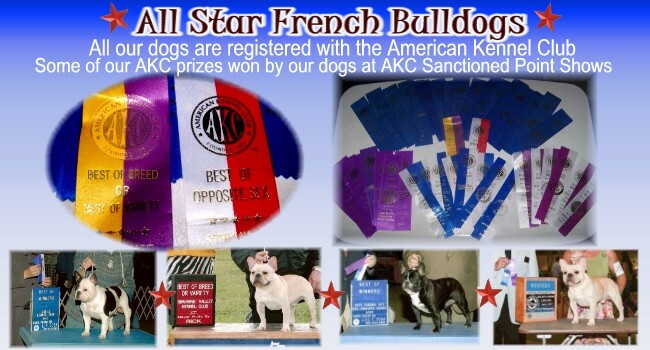 Our French Bulldogs and French Bulldog Puppies have great pedigrees loaded with AKC Champions. We have beautiful Frenchies.... The plethora of French Bulldog photos all over our site are ALL of our own dogs and babies in their new homes with our "frenchie families" and they speak for themselves. We have tons of French Bulldog Videos also... take a look at our dogs and babies on our YOU TUBE CHANNEL. We are NOT a KENNEL.. all of our dogs live inside our home here in Florida. All our Frenchies are Born in the USA & NEVER Imported and ALL are raised inside our home and raiaed by us ONLY, no puppy nanny or someone else caring for them. They are AKC Registered with Champion Bloodlines and we have 2 AKC Champion Studs. All our dogs are AKC Champion Sired/Champion Sired parents and DNA Verified. We offer occasionally French Bulldog Puppies, we do NOT have puppies every single month. When we do have French Bulldog Puppies for sale they will only go to loving homes. All puppies are handled since their birth at our vets office and are raised inside our HOME. !! !WE ONLY BREED FRENCH BULLDOGS!!! We do not deal with Imports, Puppy Mills or Brokers. Our French Bulldogs have the typical funny frenchie personalities, beautiful blocky heads, irrisistable smooshy faces and those great bat ears the breed is loved for. Our TOP priority is to have frenchies with sound temperaments, happy and healthy. Having years of experience with dogs, we understand the importance of a proper health regimen & also believe in and practice holistic and natural methods for our dogs. Our Frenchies receive the best we can provide, just take a look around, you can see that for yourself. We are not show breeders, but we do have our males shown in AKC Conformation Shows by professional AKC handlers. In our eyes they are ALL STARS, Champions or not, HENCE OUR NAME!!! 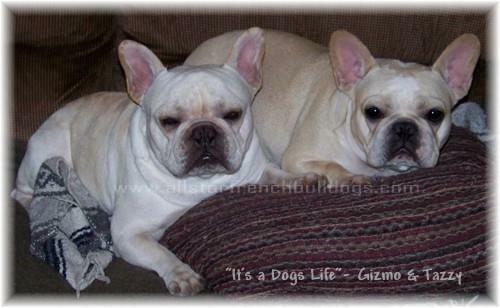 Owning bullies for almost 30 years now, we came upon the French Bulldogs in 2002. After much research and studying the breed we decided they were indeed the dogs for us. We got our first French Bulldog & haven't stopped laughing since. That wonderful Frenchie personality and their clownish traits got us hooked. 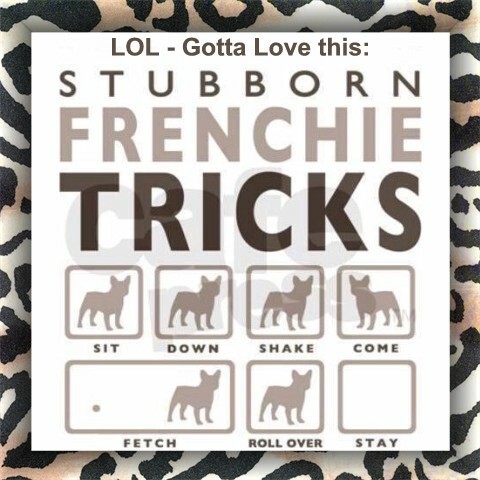 We caught the ever so contagious FRENCHIE FEVER and it's been years of fun now as a French Bulldog owner & enthusiast first and French Bulldog breeder second. They are constantly amusing us and they bring endless amounts of joy, love & laughter. We are fortunate to share our lives with them. French Bulldogs or as the French say "Bouledogue Français" are also called: "Frenchies", "Frog Dogs" and "Clown Dogs". They they are happy, loving, loyal and always making you laugh. They are definitely a unique breed and have many things about them that no other breed has. You'd have to own one to know it. Not only in personality, but in looks... They are not too small or too large, they are muscular and compact... they have that beautiful smooshed face that may be an acquired taste to some, but how can you just not love that face... And those ears... Those BAT EARS the breed is known for is what sets them apart from the other FLAT FACE breeds out there..... Just adoraBULL and irresistaBULL. French Bulldogs have big personalities and they are often said to be BIG DOGS in LITTLE BODIES so you mjust be aware of that when thinking about getting one. We encourage everyone to do their research before acquiring a dog. Every breed has genetic weaknesses that dispose them to certain diseases, and their temperaments (and yes mostly looks) are why we choose one breed over another. IF YOU GET AN EMAIL FROM A GMAIL ACCOUNT WITH OUR NAME IT IS ***NOT*** US!!!!! Email us directly, that is the only way to know for sure it is us. See Puppy Info/About Us Page! !!! 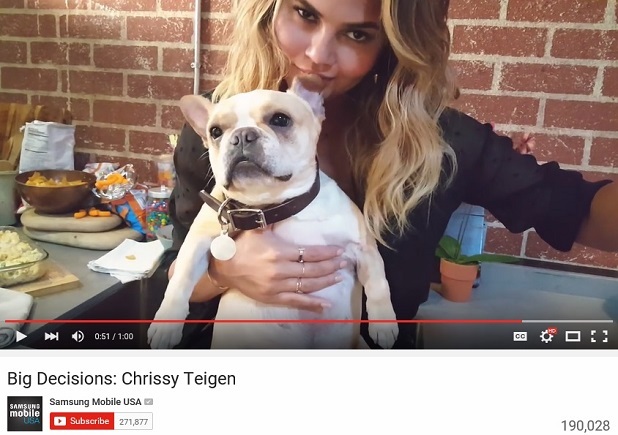 French Bulldog Puppy SCAM ALERT !!! ***2015 Important FYI*** ... Just as important in 2017 1-Does All Star advertise puppies anywhere on the Internet??? NO... NEVER. Never have and NEVER will. The only site we have ever or will ever place a puppy up for Adoption is here on our *AvailaBULL Page*. 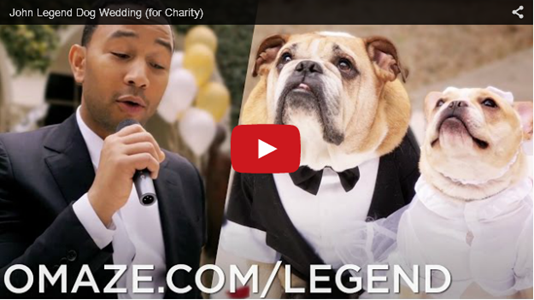 The only site we have ever or will ever place a puppy up for Adoption is here. If you see ANY of our photos somewhere else online know that they are STOLEN and it is NOT All Star. Our website is linked on dog sites and different places around the web, it's how the Internet works due to search engines, but as far as us advertising a specific puppy or dog as Available anywhere, NEVER!!! The one and ONLY email to inquire about our babies is listed on this website and has been the same for almost a decade. Fill out a Questionnaire and sent it. It's very easy and quick. Scroll down on this Page to see ADOPTION PROCESS... It's 2015 people... Scammers are stealing pictures all the time, not just Frenchies, but many breeds!!! Look at our *SCAM ALERT* page to see how they have stolen our photos along with other breeders, including photos of our FRENCHIE FAMILIES who have adopted babies from us. ****As of the Fall of 2014 any new PHOTO and VIDEO posted by All Star has been/will be WATERMARKED. We did not know when we created this site 13 years ago that we would be victims of scammers stealing our personal photos/videos.Sign of the times.... Not only do people have to be careful of dog thieves who steal dogs in person, but also scammers online... Just a sad world we live in. ****TIP:If someone has a puppy they claim is really theirs and you are in doubt, ask them to take a RECENT PHOTO OR VIDEO CLIP of the puppy with them holding a piece of paper next to the puppy with the date and your name on it and have them send it to you to show you it is recent and real... You will NOT hear back from them if it is a scam because obviously they do not have the puppy. Go with your gut, ALWAYS talk to the person over the phone NOT over text.. Ask for references if you are not sure and remember if it sounds too good to be true, IT IS. 2-Does All Star have Partners or CO-Ownerships???? NO... ABSOLUTELY NOT!!! NEVER have and NEVER will. If you see anything that has to do with advertising dogs anywhere on the WEB, whether photos, writing, whatever... saying it is us or that they are associated with us... It is a SCAM. We do not co-own dogs with anyone and we do not have any partners, puppy sitters, agents, workers, shippers, etc... If you hear of anyone saying they are PARTNERS or they work with us in any way DO NOT BELIEVE them. We are not a business, these are our babies. 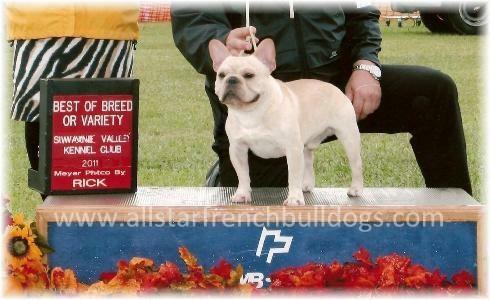 The one and only dog we own that does not live with us is our AKC Champion "Spike" who is living in Texas with a very well known and long time Frenchie Breeder of OVER 40 years "Linda McKee" who is using Spike as her stud, but he is still our dog, he is not co-owned. You can see him on the *OUR FRENCHIES* page. 3-Does All Star ship or transport dogs??? No Dogs/Puppies will ever be shipped!!!! We do not and will NOT ever ship any dog/puppy as CARGO or use a private "puppy/dog" service or transport and will never use a so called "puppy nanny" or "agent" that will supposedly fly with the puppy/dog. If you want a puppy/dog from us we must meet face to face & personally hand you your puppy/dog!!! To see how "Shipping/Pick Up" works... Look on our *SHIPPING PAGE*, it is a VERY simple and EASY process and we have many references that can attest to this. This is OLD NEWS and I believe all if not MOST of the puppies were recivered, but left this here for those who have not heard about it. It's real... it happens and if you are a breeder or owner of a FRENCH BULLDOG you HAVE TO BE CAREFUL!!!!! A friend saw this on TV and emailed tonight 01/02/14. So sad. Then people wonder why breeders are paranoid when random strangers email asking "Can I go in to your home to see your dogs and puppies".... People wonder why some breeders have security cameras, security alarms and are armed. It's not the first time, unfortunately small expensive breeds are stolen a lot. This is the most heartbreaking thing for a breeder to go through. Not only stealing the innocent 15 puppies as the article says, but they were ripped from their mothers so young and they also stole their prized Champion French Bulldog stud! I believe the people who did this had to know this breeder. I always tell people when acquiring a pure bred puppy ASK to see photos. We always provide photos of momma pregnant, of the puppies as soon as they are born at the Vet, photos of the entire litter nursing on their mother and update the entire litter every 7-10 days from birth until they are ready. Don't just accept a few photos when they are ready to go. The puppies should be off DNA registered sires. I have this news here to help this breeder if I can in any way, but also to educate people. I will go hug my babies now. Keep your eyes out and to fellow breeders, remember you can NEVER be too careful, dont let anyone tell you otherwise. To the owner of these babies and Champion, I will pray for their safe return!!! Update: I believe the puppies or at least most were found, but I will leave this here for a bit so breeders are aware of what can happen. It doesnt always make the news, but this happens a lot and not just with frenchies. Be warned and never be too careful. 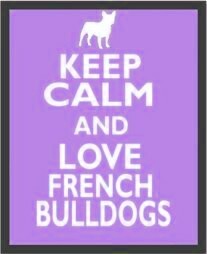 We love to talk about our Frenchies and love helping others out, it's all for the breed at the end of the day!!! 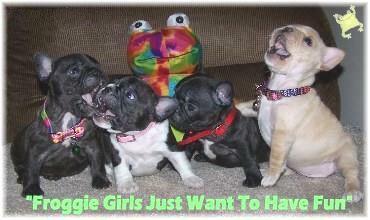 Hope you Enjoy our Babies.... Best Wishes in finding your perfect frog dog!
. :: [Puppy Info/About Us/Contact] [AvailaBULL] [Nursery] [Our Frenchies] [Past Puppies] ::.
.:: [French Bulldog Questions] [French Bulldog Standard] [Frenchie History] ::.
.:: [Frenchie Purchase Tips] [Why Pedigrees Matter] ::. French Bulldog Health, Heat Tips, etc... Look on Left Side above. DISCLAIMER NOV 2013: This disclaimer has been listed on individual pages on this site so adding it here. 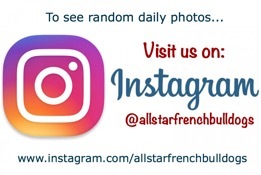 Every single photo on this site, besides some vintage photos on our History/Historical pages and the photos on the Famous Frenchie Page, all other photos on this site are of OUR OWN DOGS and our extended family of dogs owned by our Frenchie Families. We have seen photos of our own personal dog posted on online sites listing our puppies for sale from photos they have stolen from us. I know how it feels to have your photos used maliciously. All Star would never use any image/drawing/graphic in a derogatory manner, simply for Breed Education or Historical purposes. If you own the rights to the few photos that do not belong to us and you want credit or removal, just ask. If we have people within the "same breed" arguing or slandering one another that does nothing for the breed... There are more important things in life. I do not stand for personal attacks or slandering of any kind .... not my style. Life is too short to "sweat the small stuff". This is directed to EVERYONE who reads this, NOT to any specific person. Please NOTE with all this said ... 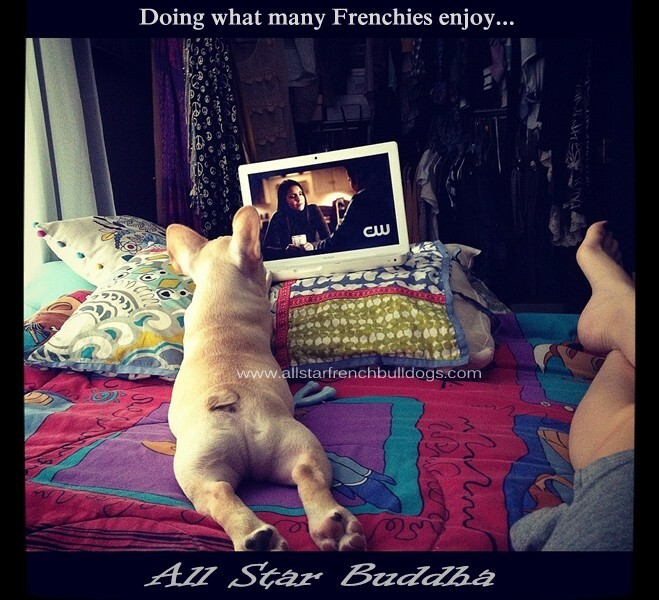 I will repeat 99.9% of the images/photos/logos on this website were taken by All Star and /or created by All Star and/orthe All Star "Frenchie Families" and they belong to us. 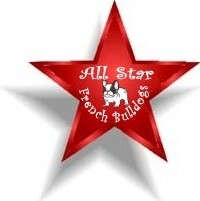 May you enjoy our site as it was created with love for the French Bulldog Breed. God Bless!! !